Mustard is a thick yellow dressing or condiment made from mustard seed, vinegar, water and spices. It goes well with meat and cheese in sandwiches. It is also used to make dips and sauces. 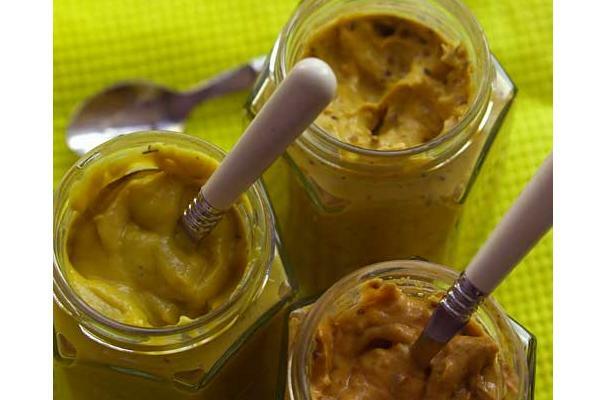 There are various types of Mustard which include Dijon Mustard, Yellow Mustard, Honey Mustard and French Mustard. They range in flavor from sweet and spicy to tangy and mild. Mustard is also available in powdered form by grinding the seeds. Choosing: Check for expiration dates. Do not buy mustard with broken or damaged containers. Do not buy mustard with molds. Refrigerate after opening. Mustard will last nearly forever or for as long as you keep it refrigerated. Refrigerator storage time shown is for best quality only - after that the mustard's texture color or flavor may change. if mustard develops an off odor, flavor or appearance, it should be discarded for quality purposes; if molds appear it discard the entire product. The mustard seed is a prominent reference for those of the Christian faith, exemplifying something which is small and insignificant, which when planted, grows in strength and power. Pope John XXII was so fond of mustard that he created a new Vatican position - grand moutardier du pape (mustard-maker to the pope) - and promptly filled the post with his nephew. In 1866, Jeremiah Colman, founder of Colman's Mustard of England, was appointed as mustard-maker to Queen Victoria. Colman perfected the technique of grinding mustard seeds into a fine powder without creating the heat which brings out the oil. The oil must not be exposed or the flavor will evaporate with the oil. We all know that losers and quitters can't cut the mustard (live up to the challenge). And perhaps the reason ballpark mustard is so popular is because pitchers apply mustard to their fastballs to get those strike-outs. The disabling and even lethal chemical weapon known as mustard gas is a synthetic copy based on the volatile nature of mustard oils. History: Mustard is a member of the Brassica family of plants which bears tiny round edible seeds as well as tasty leaves. Its English name, mustard, is derived from a contraction of the Latin mustum ardens meaning burning must. This is a reference to the spicy heat of the crushed mustard seeds and the French practice of mixing the ground seeds with must, the young, unfermented juice of wine grapes. At first, mustard was considered a medicinal plant rather than a culinary one. In the sixth century B.C., Greek scientist Pythagoras used mustard as a remedy for scorpion stings. One hundred years later, Hippocrates used mustard in a variety of medicines and poultices. Mustard plasters were applied to "cure" toothaches and a number of other ailments. Prepared mustard dates back thousands of years to the early Romans, who used to grind mustard seeds and mix them with wine into a paste not much different from the prepared mustards we know today. The English word "mustard" derives from the Middle English moustarde, a combination of the Old French words moust (must) and ardens (burning). Moust derives from the Latin mustum, meaning "new wine"